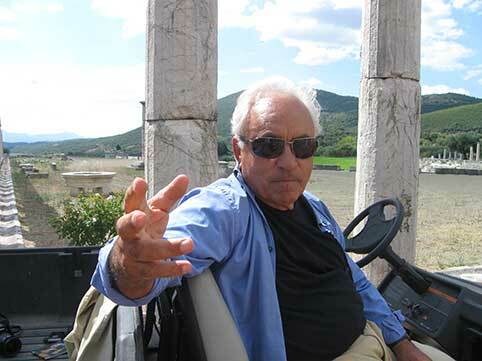 Petros Themelis graduated 1959 in Classics and Archaeology from the University of Thessaloniki. Doctoral thesis under the title “Frühgriechische Grabbauten” submitted to the Institute of Archaeology of the University of Munich, Germany in 1972 and published in Mainz by Zabern Verlag in 1976. 1962/63 worked as scientific assistant at the archaeological district of Western Macedonia and participated in excavations at Thessaloniki, Pella, Vergina and Stratoni of Chalcidike under the direction of the late Ephoroi (Directors) of the Archaeological Districts) Photios Petsas, Charalambos Makaronas and Manolis Andronicos. From 1963 to 1980 he served as Curator and Ephor of Prehistoric and Classical Antiquities at the Districts: a) of Elis and Messenia, b) of Attica and Euboea, c) of Phocis and Aetolia-Acarnania. From 1977 to 1980 he was director of the Museum at Delphi, from 1980 to 1984 director of the “Service of Palaeo-anthropology and Cave Research” at Athens. In 1984 he was elected professor of classical archaeology at the University of Crete. From 1987 to 1989 he was Vice-chancellor for Academic Affairs and President of the Research Committee at the same University. Since 1985 he is director of the University excavation (Sector I) at ancient Eleutherna on Crete, since 1986 he is directing the “Excavation and Restoration Project” on the part of the Archaeological Society at ancient Messene in the Peloponnesus financed by the Greek Ministry of Culture and the European Community.